After profiling system enhancers and troubleshooting apps, our look at the best bargain software turns to the fun side of the Mac, with programs that will help you get the most out of your digital lifestyle. Below, I share 10 of my favorite multimedia programs—everything from image-editing tools to special effects generators. On the next page, we’ll look at five must-have programs for managing iTunes and your iPod, as well as two top podcasting helpers. Comic-art imitates life You can turn your photo albums into comic books with Comic Life. Amadeus II 3.8.7 ( ; $30; HairerSoft ) is a low-cost two-track app for recording and cleaning up cassettes and LPs, or for editing existing audio files. It has added support for the MP4, M4A, AAC, and FLAC formats since our last review. iStopMotion 1.10.1 ( ; $40; Boinx Software ) adds to an amateur moviemaker’s bag of tricks, with stop-motion animation and time-lapse recording features. When it comes to adding watermarks to photos you own, there’s no better tool than iWatermark 3.0.7 ( ; $20; Script Software ), thanks to its ease of use and functionality. 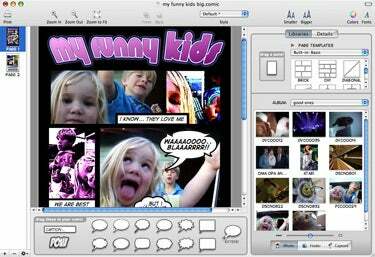 QuickImage CM 2.4 ( ; free; Pixture Studio ) provides a quick way to view all the pictures you get via e-mail or download off the Web. Its contextual menu lets you view (and edit) images in a floating window in the Finder. Your laptop can be a great portable entertainment center, but playing DVDs drains battery power something fast. Extend your playback time by copying DVDs to your hard drive using MacTheRipper 2.6.6 ( ; free; Geezerbuttz ). Netflix Freak 2.4.1 ( ; $15; The Little App Factory ) gives Netflix patrons a better interface than Netflix does for managing and searching for DVD rentals from the online service.